Pierate - Pie Reviews: Why Come to Wycombe? 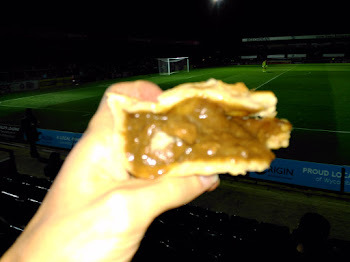 Having eaten quite a few pies at football matches in our time (see our football pie league), one of the main problems tends to be whether the pie is cooked properly. When trying to prepare so many pies in a short space of time it is tempting for clubs to not cook them for long enough and then let them dry out as they try and keep a large number of pies warm. The Phat Pasty pies being served at Wycombe last season were a prime example of a pie done in a bad way. Whilst it wouldn't put ardent fans off from attending the game given that Wycombe are struggling with falling attendances perhaps some of the more casual fans are wondering why come to Wycombe when the pies are so bad? Having attended the Wycombe v Cambridge match last night I was excited to see a new pie being served. 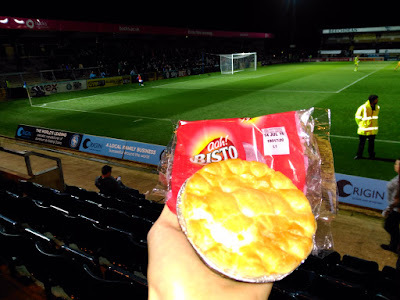 Had Wycombe taken our advice to replace the Phat Pasty pies after just 1 season? Now they are serving Bisto branded pies which is a brand I had not come across before. A Bisto branded pie does make sense to some extent. I expected that whilst it might not do anything outstanding, if it was made with Bisto gravy it would at least not taste bad, after all apparently Britons have 1.6 billion meals with Bisto every year! I grabbed the last Steak pie for £3. I then noticed that the pie was in fact made under licence by our friends in Wales, Peter's Pies. I was please about this because before last season's change, Wycombe served Peter's Premier Pies for a number of years and we had previously scored them well. My expectation was that this would effectively be a standard Peter's pie under a different brand. I was soon left feeling rather deflated as I delved into the pie, the pastry sides and base were decidedly soggy and completely fell to pieces, just like my hopes of a good pie. It seemed like this pie had not been cooked properly at all. It seemed as if it had been microwaved. My fears were soon confirmed when I learnt that the pie can be microwaved cooked from frozen. Whilst this can save time it is not normally recommended by the Pierateers, it will often result in soggy or dry pastry. Sadly, poor cooking has again let Wycombe down. This wouldn't have been a complete disaster if the pie wasn't also completely tasteless. I would have expected it to at least taste like Bisto gravy but in fact the gravy was just tasted watery, starchy and fatty. The only redeeming feature was the good amount of steak chunks in the pie. There weren't any chewy pieces. However, these were also somehow fairly tasteless! I couldn't help but feel that this really was a pie to avoid even if it had been cooked properly. The only thing that impressed me was that Wycombe had managed to find a pie which scored worse than last season. Oh well, at least it can't get worse, can it? See the score breakdown below. Fortunately for Wycombe, they were so near the bottom of our Pie Football League (the PIEremiership) that losing some points does not currently see them move down the table. 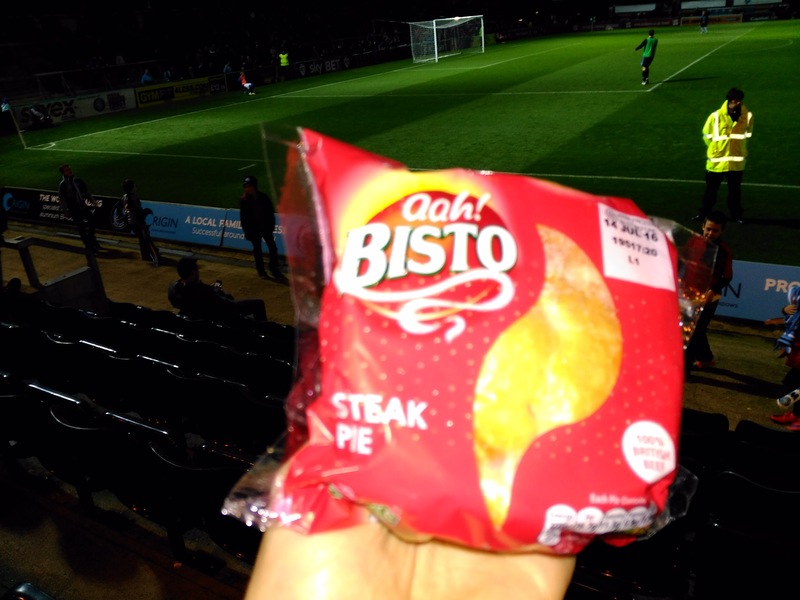 Condition - 3.5 out of 7 - The pie arrived wrapped in Bisto branded plastic. The wrapper gives away that these pies come frozen and can be microwaved. Colour - 2.0 out of 7 - Whilst the flaky lid looked crispy brown the sides and base appeared raw and unappealing. Cheapness - 3.5 out of 7 - A pretty standard price for league 2 but I would normal expect something a bit better at the price. I guess it did at least have quite a lot of steak chunks. Capacity - 4.9 out of 7 - This was an area where the pie did quite well, it was a decent size and also well filled. Chewiness - 3.5 out of 7 - The texture to the tender steak was let down by an awful texture to the pastry, it just fell apart when I tried to take it out of the case. The sides and base were so soggy and under cooked it felt like I was really eating raw flour. Content - 2.0 out of 7 - Terrible, I am not sure how they made the whole thing so tasteless, I really didn't enjoy it. My Dad also tried it a said it was a '1 out of 7', whilst I might not be that harsh, I doubt many people would say they enjoyed the taste of this pie. Consistency - 2.5 out of 7 - Soft and stodgy, the pastry had a horrible consistency. Perhaps the filling was not so bad, the sauce being just about thick enough to stay in the pie (had the pastry not fallen apart). This is quite a new pie from Peter's, having been released this year and I think it needs more work. Peter's have experimented with making pies under other brands before, such as the Heinz pies we have reviewed, however, it seems that they are best when they are using their own brand. I wouldn't expect these Bisto pies to be around for long.